We have already discussed what are Latent semantic Indexing(LSI) keywords and how to find them. Here, we will learn another way of finding out these words using SEOpressor WordPress plugin. Read review of SEOPressor v5 here. In order to rank high in Search engine such as Google, it is good to have more and more LSI terms (or keywords) related to targeted keywords. Read more at What are LSI keywords and how to improve SEO using them. 2) Google related keywords at the bottom of the search results for main keyword. Find the detailed post at how to find LSI terms. 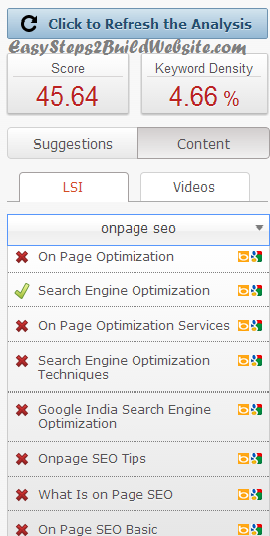 I have tried several SEO plugins, however this is the best plugin I have got. This plugin has almost all the features that are required to maintain a good Onpage seo. I would be sharing its features in the coming posts, this post is all about LSI so I’m gonna show, how it can be useful for finding out them. If you don’t have the plugin then buy from here. Once you have it installed, it starts showing SEO score and many more suggestions along with LSI in WordPress edit post screen (see below screenshot). You have to just add your target keywords (you can add upto 3 keywords) and hit refresh. It will show you LSI for each of the keyword you have added. Checkout the above screenshot, I have taken this while writing this post, It is showing the most relevant related terms (OR lsi words) to my targeted keyword. If you have more than one main keyword than you have to select the keyword from dropdown to know the suggestions.